It was as much of a shock to me as anyone that I became an iPhone user, but here I am, walking around with my iPhone 6. Now here’s the issue… Apple seems to get you every time. You buy a new iPhone, and the battery is strong and good for more than a day. Then you start adding apps; then you start connecting to Bluetooth devices and Wi-Fi networks; then you start this and that and that and this… and soon enough you find yourself having to recharge every few hours to make it through the day. What a pain. When I had my iPhone 5 I bought a case that was supposed to extend your battery life… it was big and clunky, and after a few weeks it just stopped working. So here I was, walking around not only with my phone, but also with a USB charger and an iPhone cable. Of course, when I was in my car or office it wasn’t a problem because (when I remembered to) I could just plug in there… but that meant that I needed to invest in two more lightening cables… and did I mention that at $29.99 the cables lasted about as long as a box of doughnuts at an IT Pro user group… I found myself having to replace at least one every couple of months. So when I was asked to try a new device called ThinCharge from ChargeTech I was skeptical… but I promised to keep an open mind. At first glance the add-on case looked a bit flimsy, and that is a word that always bothers me when it comes to something that will sit in my back pocket. I clicked my iPhone 6 into place and attached the top, and I was pleasantly surprised… all of a sudden the device did not seem to be a flimsy add-on, rather an integral part of my phone. It was not meant to be removed and re-added, but to live on the iPhone forever. Because of that the design seems to take extra care to add as little size and weight as necessary to the phone (a little over a millimeter on the bottom as well as on each side). One huge benefit that I found to the ThinCharge is that it plugs in to the lightening connector on the bottom of my iPhone (which I always found to be an inconvenient placement, especially when placing the phone in a cup-holder in my car) and adds the lightening port to the top of the device; this allows me to place my phone on any surface right-side up while charging, which means I am less likely to damage the ridiculously expensive cables. Another point in the ThinChare’s favour. When plugged in the ThinCharge charges your device first; but while doing so it also seems to charge itself. When the phone is at full charge it then continues to charge itself until it is full. 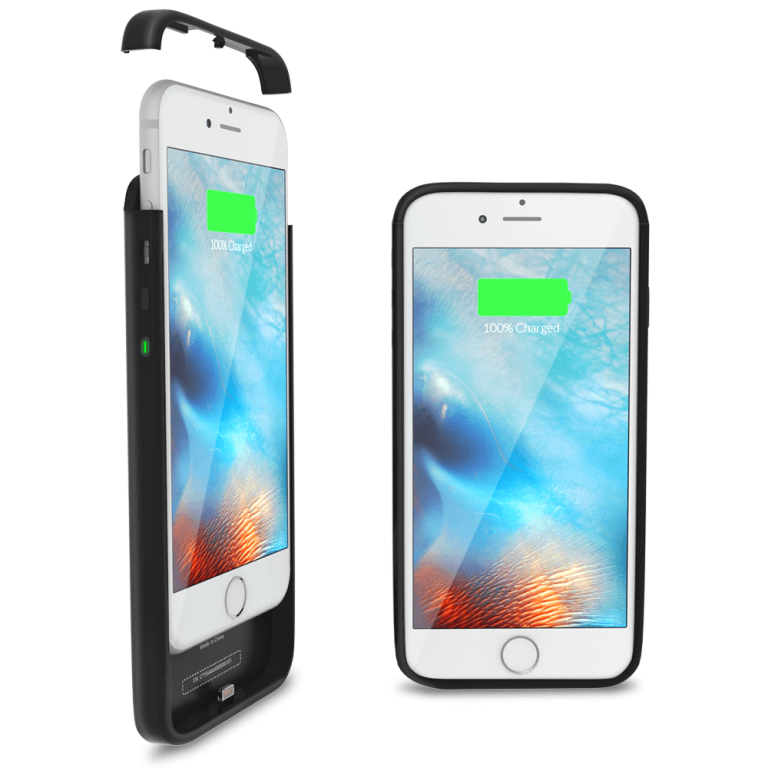 There are no added buttons on the ThinCharge; when you are on the go and you find your iPhone battery waning, you press and hold the up-volume button for three seconds and your iPhone starts charging off the extra battery. When it is back to full juice it just stops charging. The website claims the Lithium-Polymer battery has a 2,600mAh capacity, effectively doubling the capacity of your iPhone. So it will not replace an external charging brick for your three-day camping trip, but it will allow you to leave that brick at home when you leave the house early in the morning with a long day ahead. And at 70g the weight is insignificant, and the size will not change how it feels in your pocket. Of course, because it is changing the actual size of your device, you will not be able to have other fancy or colourful iPhone cases… but to compensate the ThinCharge is available in black, gold, and white… and the smooth surface means you can place whatever decorative stickers you want. If you are an iPhone owner this is a definite BUY recommendation… I will not soon be going back to the old way of doing things. Very cool device. Great way to charge my iPhone without a bunch of bulky hardware.